The three productivity apps from Apple for the iPad has been updated today, that’s Pages, Keynotes and Numbers. I’ve had the chance to work a little bit in all of them (before the update today) and they’re pretty cool, considering what it is they actually do. – Copy documents between Pages and your MobileMe iDisk or a WebDAV service. – Option to display the word count for your document. – Support for opening .txt files from Mail. – Ability to group and ungroup objects. – Import and export existing footnotes, endnotes, sections and tables of contents. – Import and export Pages ’09 tables with image background fills in cells. – Improved export of tables with customized borders. – Improved font matching when importing a Pages or Microsoft Word document. – Improved creation and editing of hyperlinks. – Improved text options for tables including font, size and color settings for individual cells. – Improved usability and reliability when sharing documents via iWork.com public beta. – Improved reliability when importing documents with large images. – Improved reliability when importing and exporting documents with overlapping objects. – Improved handling of fonts when exporting documents to Microsoft Word. – Improved reliability and performance when importing Microsoft Word documents. – Export presentations to Microsoft PowerPoint (.PPT) format. – Copy presentations between Keynote and your MobileMe iDisk or a WebDAV service. – Support for audio in builds when importing Keynote ’09 presentations. – Add animated builds to grouped objects. – Lens Flare, Spin and Wipe build animations. – Revolving Door, Swoosh and Wipe slide transition animations. – Improved slide size conversion when importing Keynote ’09 presentations. – Import and export Keynote ’09 tables with image background fills in cells. – Improved font matching when importing Keynote ’09 or Microsoft PowerPoint presentations. – Improved creation and editing of web hyperlinks. 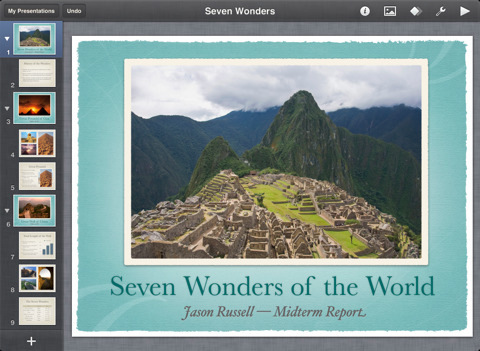 – Improved usability and reliability when sharing presentations with iWork.com public beta. – Improved reliability when importing presentations with large images. – Improved reliability when importing and exporting presentations with overlapping objects. – Improved reliability and performance when importing Microsoft PowerPoint presentations. – Export spreadsheets to Microsoft Excel (.XLS) format. – Copy spreadsheets between Numbers and your MobileMe iDisk or a WebDAV service. – Open CSV files from Mail and other apps. – Import and export Numbers ’09 tables with image background fills in cells. – Improved font matching when importing Numbers ’09 or Microsoft Excel spreadsheets. – Improved creation and editing of hyperlinks in text boxes. – Improved usability and reliability when sharing spreadsheets with iWork.com public beta. – Improved reliability when importing spreadsheets with large images. – Improved reliability when importing and exporting spreadsheets with overlapping objects. – Improved reliability and performance when importing Microsoft Excel spreadsheets.